NASHVILLE, TN...(September 26, 2013)... Country music star and award-winning TV host Craig Morgan is set to appear on an upcoming episode of Sing For Your Supper, a new TV series airing on PBS. “Sing For Your Supper with Bob Waggoner,” a new, interactive cooking series and webcast combining America’s love affair with food and music, is the first culinary series filmed at the legendary Ryman Auditorium. Catch Craig Morgan on “Sing for your Supper with Bob Waggoner” on PBS affiliates around the country, starting September 26. Check local listings for show times. 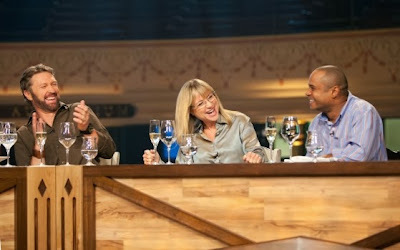 Sportsman and entertainer Craig Morgan is joined by friend and chef Victor Lugo of Lugo’s Restaurant in Dickson, TN as well as Sommelier Elise Loehr for the taping that took place earlier this year. Waggoner and the evening’s guest chef, USA Today’s Brian Mansfield, prepare several dishes together for the assembled guests, including an elk loin entrée using protein harvested by the singer himself. During the broadcast Craig also performs his latest hit single, “Wake Up Lovin’ You,” marking the national TV debut of the song, which can be found on his recently released CD, The Journey (Livin’ Hits). The series filmed earlier in the year in front of a live audience seated on the Ryman stage. “Sing For Your Supper” is hosted by Chef Bob Waggoner, executive chef of The Watermark Restaurant in the Gulch area of Nashville. Mike Kirk/Gilded Age Films is Executive Producer with Anastasia Brown serving as Producer and Music Supervisor. The series is produced in cooperation with WETA Washington, DC and will air on PBS affiliates around the nation beginning Fall of 2013.